Agenda writing can be very demanding but worthwhile at the same time. It may easily guide participants on where to go and what to do at a given time period. It gives an insight on what must be accomplished within the time allotted to ensure that participants remain well-informed at all times. Because of such, it must be created well enough to serve its purpose. 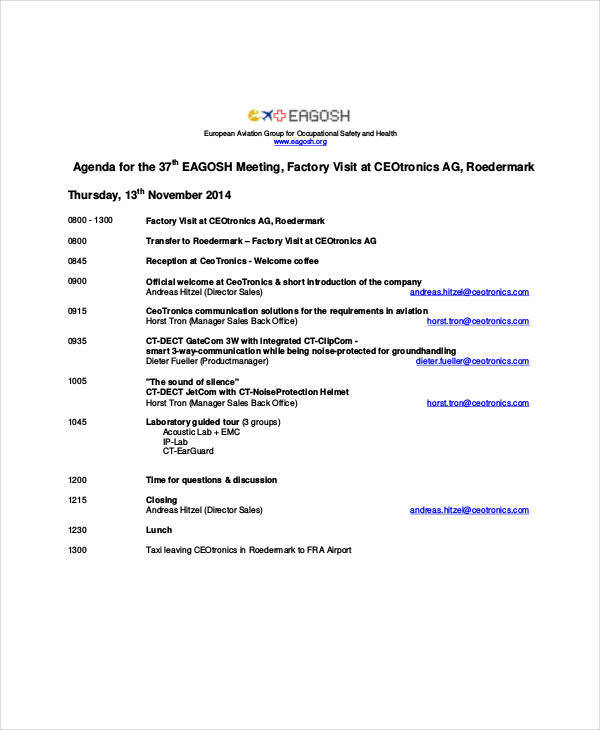 In creating an effective meeting agenda, key points need to be discussed clearly. 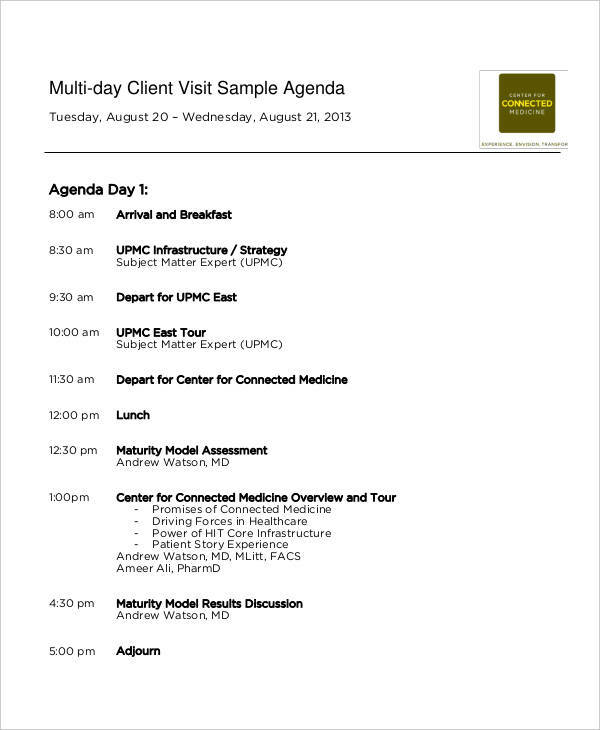 But to create an effective visit agenda, other matters must be focused on for it to run smoothly. A visit agenda and an itinerary is often used interchangeably. An agenda is a list of things to be done, such as a meeting of topics and issues to be discussed. There are multiple agenda examples that support this thought. An itinerary, on the other hand, focuses on the things to be done on a trip and other significant details of a particular location. 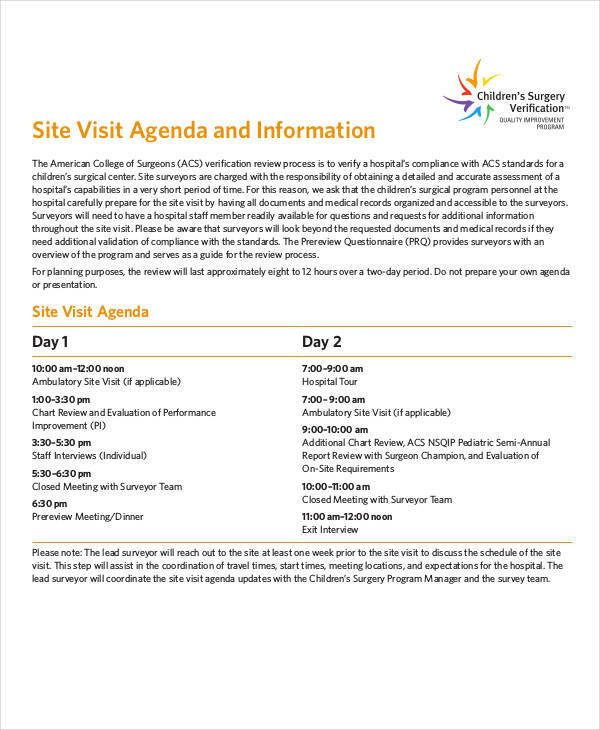 A visit agenda is a strict list of details and instructions made for formal visits that are under a tight schedule. There are multiple agenda examples in excel that you can follow. But if you want to start from scratch, there are things to consider in writing a visit agenda. The agenda must contain all the necessary details and instructions. From the participants involved to the given time period, even the smallest details are essential to carry it out. The agenda’s title should also provide a clear message to its readers, containing a proper insight of what the printable agenda is for. 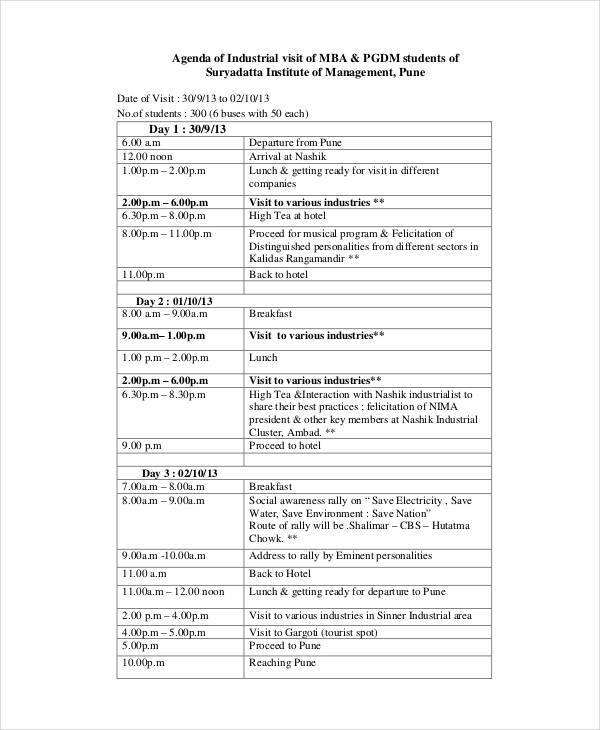 The details of the visit must also be well organized. Travel time might affect the next activity, so you must be practical when setting each activity. 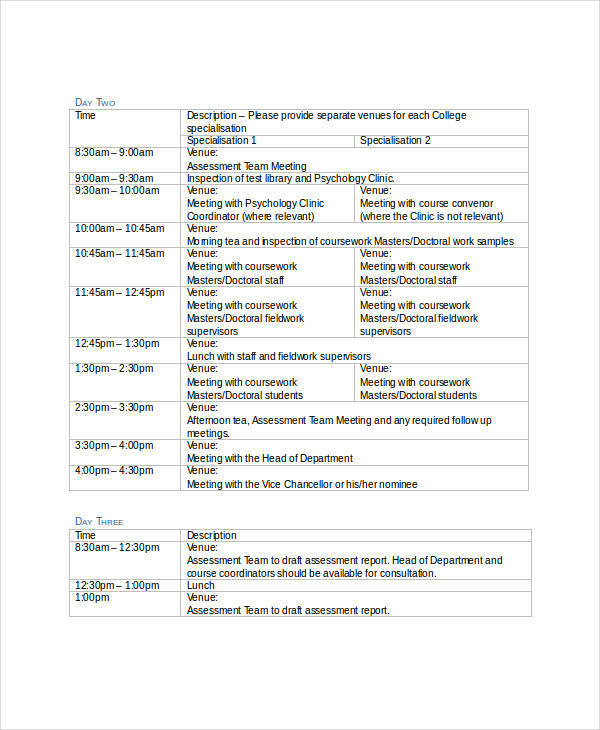 To prepare a visit agenda, you need to know what needs to be covered within a given time period. These are the essential parts of the visit that have to be accomplished. If you wish to include an activity on the list, the details on how to achieve it must be thought through. This would include transportation and other essential materials. 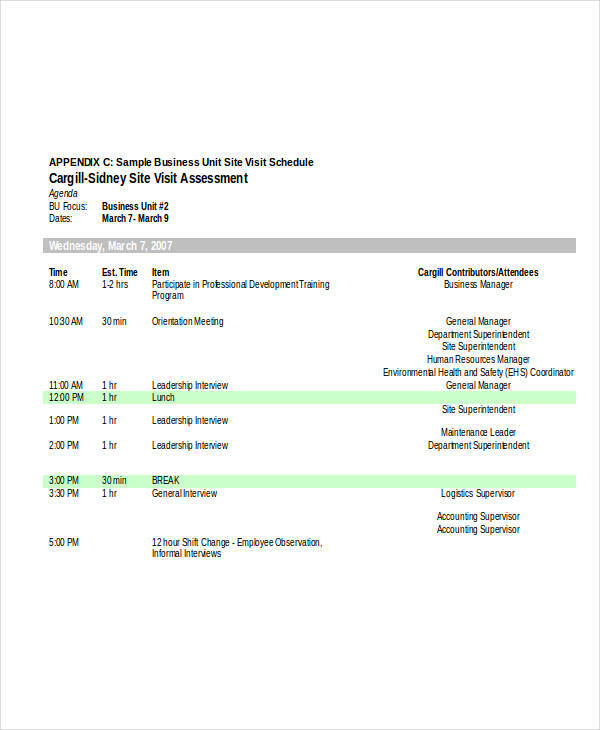 You may also see agenda examples in word to serve as your guide. Estimated time schedule. Although a schedule can alter due to unforeseen circumstances, it’s good to prepare a time frame for each activity to carry out smoothly. Start and finish. Although it’s not necessary to end the day formally, it’s a good idea to indicate the start and end of the agenda properly. Additional notes. These could be instructions on how to carry out activities. Update regularly. Changes in schedule or activities must be reflected immediately to avoid any form of conflict.